I love my food blog. I promise, I really do. It may not seem like it, what with the lengthy lapses between posts, but rest assured it stems not from lost love, but merely sheer laziness. I believe I suffer from the worst combination of oxymoronic actions: dogged procrastination and uncertain guilt. I am one of those perpetual, eternal, steno notebook-wielding List Makers constantly adding to a mile-long chart of duties "TO DO TODAY." You can bet your bottom dollar there are plenty of highlighters, inked stars, underlines, and boxes involved. I get a rush when I strike a line through a completed task. But there are many items on the list that survive from week to week, those I put off until I either resign them to never be completed or try to pretend I never really wanted to do them in the first place. This all leads to much guilt. I realize the lists may be the end of me, but I always return to them. I still have love for them. But back to the point. My food blog. Which I love. Here we are, it's a new day (night), a new post, and I have new (to me) food to write about. 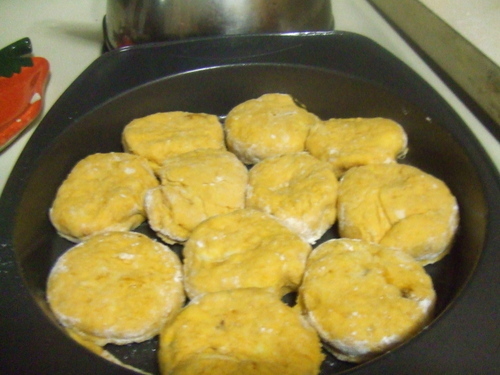 So to go with the onion rings, I thought I'd make some sweet potato biscuits since I bought some yams from Trader Joe's the other week and have been on the verge of forgetting about them (thank goodness they're on my grocery inventory list -- I'll go into that another time). Orangette had a fantastic-sounding recipe for these biscuits and she turned them into amazing sandwiches to boot! After I spotted her noted Honeycup mustard on my favorite neighborhood store's shelf, it was all over. I put the Sierra Nevada Porter mustard back (another time!) and set about with some good ham and threw in good cheddar for good measure. 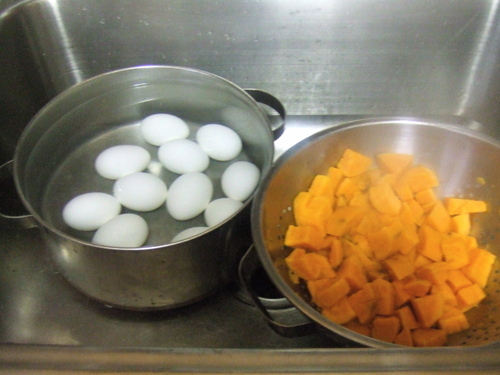 And since I wanted to use all of my sweet potatoes, I increased the recipe by half. 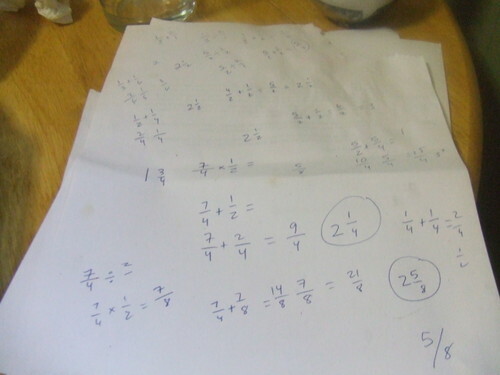 Here's a peek at my basic fraction calculations. And yes, I'm well aware of my nerdiness. Math is so not my strong suit. I was all confused. But I had great fun making the biscuits, especially patting out the dough. It was quite soft and yielding and the most beautiful rich burned orange color. 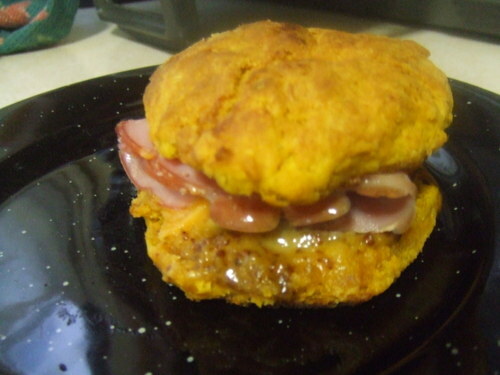 The biscuits loaded up with ham, cheddar, and the "uniquely sharp" honey mustard were a sweet, tangy, buttery success. 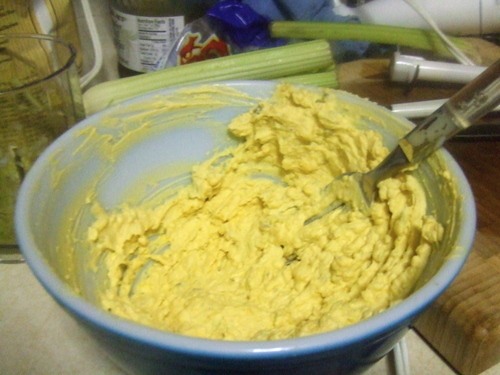 I also wanted to make deviled eggs. Going for the whole southern shebang. 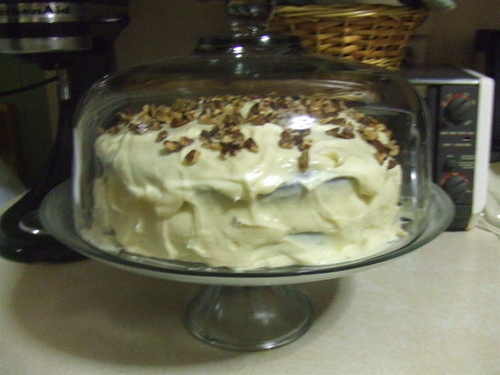 I used elements from this recipe and this one (by the way, I've become lovingly dependent on Simply Recipes. Elise is Awesome). 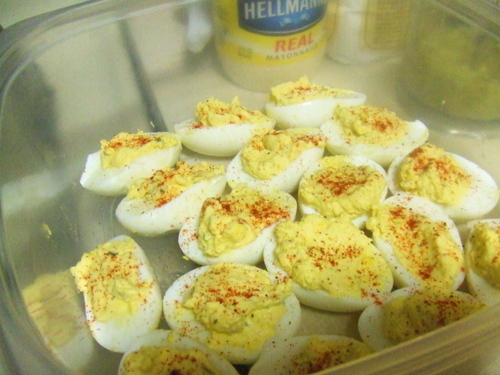 And then, being the good Maryland girl that I am, I liberally sprinkled the tops with Old Bay seasoning. Talk about kicking it up a notch. Scrumptious. These were a hit. Ah,and dessert. 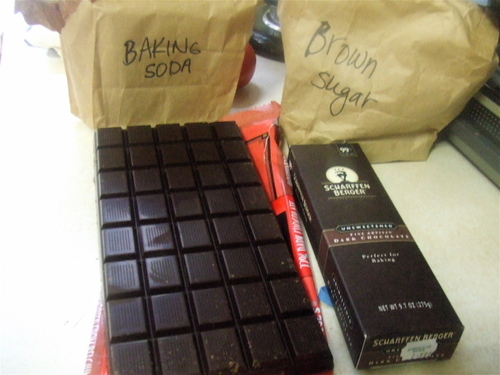 What snackfest would be complete without brownies? I saw this recipe for Peanut Butter and Fudge Brownies with Salted Peanuts and that was that. 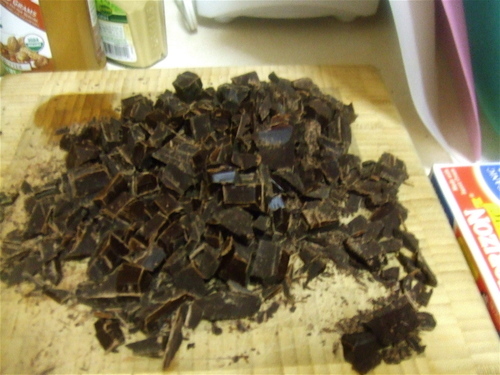 I had the chocolate out and chopped in no time. It was fun to make, no mixer involved this time (except for the incredibly! delicious! 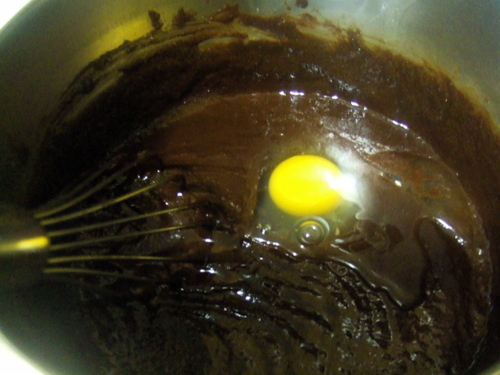 frosting) -- each element was whisked together one at a time by yours truly and it felt good to whip that glossy chocolate goodness around in the bowl, feeling each granule of sugar crunch underneath my wrist. And the result? 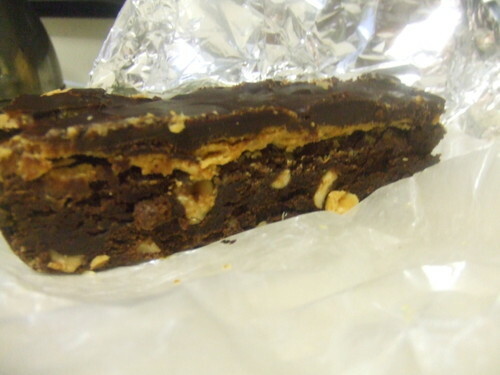 Heavenly Peanut Butter and Fudge Brownies with (50% less salt--Trader Joe's, I love you) Salted Peanuts. You might be wondering, Hey, where's the picture of the onion rings? I thought she said that's how this whole thing started. Well, they may have set the wheels in motion, but those rings didn't materialize. They're on my list of things To Do tomorrow.